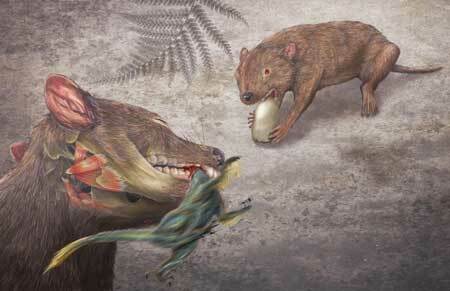 A scrappy mammal that lived alongside dinosaurs 66 million years ago may not have been huge, but it packed the most powerful bite ever recorded in any mammal, living or extinct, scientists say. 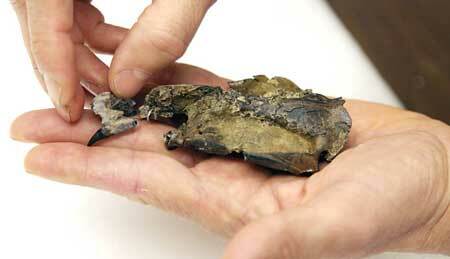 About the size of a modern badger, the animal lived at the very end of the Age of Dinosaurs in what’s now the Northern Plains, where it appears to have preyed on anything its size or smaller — including possibly dinosaurs themselves. Four specimens of the animal were recently unearthed from separate locations across the ancient sediments of the Hell Creek Formation, in Montana and North Dakota. Known as Didelphodon, or “two womb tooth,” the animal belonged to a group of mammals known as metatherians, distant ancestors of marsupials like the opossum. And the four newly found specimens include crucial parts of the animal’s anatomy that have never been found before — including upper jaws, snouts, and much of the rest of the skull. Before this discovery, most of the dozens of metatherians that had been recorded were known only from teeth and fragments of their lower jaw — elements that tend to show up most often in the mammalian fossil record. 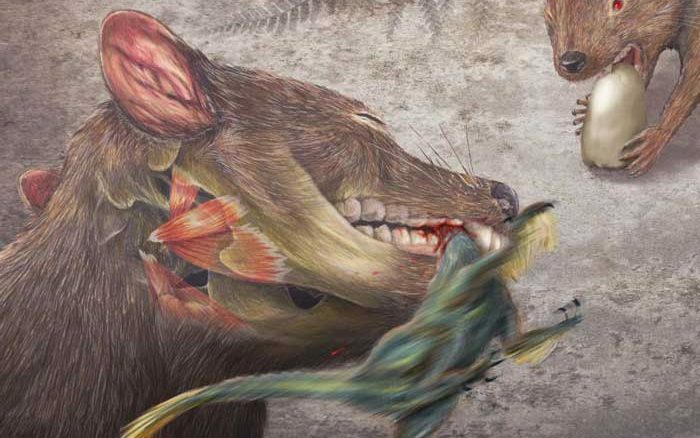 Because of the completeness of the newly found remains, paleontologists at the University of Washington were able to analyze what and how the mammal ate and also calculate the bite-force that its brawny jaws could produce. “I expected Didelphodon to have a fairly powerful bite based on the robust skull and teeth, but even I was surprised when we performed the calculations and found that, when adjusted for body size, it was capable of a stronger pound-for-pound bite than a hyena,” said Abby Vander Linden, a UW biologist who participated in the study, in a press statement. Judging by the size and placement of its jaw muscles, she explained, she found that Didelphodon was able to deliver a bite that, in proportion to its size, would put even saber-tooth cats to shame, chomping straight through bone and shearing through flesh. The fossils also allowed scientists to study Didelphodon’s teeth for microwear patterns — microscopic scratches and holes that can yield surprisingly detailed data about an animal’s diet. Dr. Jonathan Calede, a UW biologist now at Bucknell University, said that these wear patterns showed that Didelphodon was an omnivorous predator and opportunistic scavenger. It didn’t bother with the likes of insects or worms, he said. Instead it feasted on fare ranging from crustaceans and molluscs to other vertebrates like mammals and possibly even small dinosaurs. “The interesting thing about these fossils is that they allowed us to study the ecology of Didelphodon from many angles,” Calede said, in the same statement. All told, the discovery of the new Didelphodon specimens — all attributed to the species Didelphodon vorax — has introduced new insights into the ecosystems of the Mesozoic Northern Plains, the researchers said. “What I love about Didelphodon vorax is that it crushes the classic mold of Mesozoic mammals,” said Washington biologist Dr. Gregory P. Wilson, in the statement. “Our study highlights how, despite decades of paleontology research, new fossil discoveries and new ways of analyzing those fossils can still fundamentally impact how we view something as central to us as the evolution of our own clade, mammals,” he added. Wilson and his colleagues report their findings in the journal Nature Communications. Sounds like, and has the look of a Tasmanian Devil. Jaws and all.